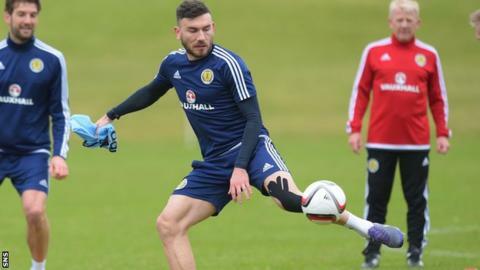 Robert Snodgrass considers his return to the Scotland set-up as "one of the last hurdles to jump" in his rehabilitation after long-term injury. The attacking midfielder missed 15 months of action after dislocating his knee cap playing for Hull City. Gordon Strachan recalled him for Scotland's friendly against the Czech Republic on Thursday. "I feel as if I'm back to where I was, but I don't feel that's good enough," Snodgrass said. "I want to kick on." Snodgrass missed the conclusion of the Euro 2016 qualifying campaign, but, having recovered from from such a serious injury, he now wants to leave the Scotland manager with a "headache" over selection. He made his return to the Hull City side as a substitute in the side that lost to Manchester City in the Capital One Cup last December. Since then, Snodgrass has started 12 games for Steve Bruce's team as they bid for promotion to the English Premier League, and he has scored twice. He admits that he is behind some of his team-mates in terms of conditioning, but feels that he is returning to his best. The former Norwich City man considers his return to the Scotland squad as a reflection of his performances since overcoming the injury. "I just turn up, try to perform at the best level that I can," he said. "The manager's got me back in the squad, so I must be doing something right. I'm always learning, so it can only be better for me working alongside this level of performers. "It's always good to get back involved with the lads. It's a new campaign and we need to focus on the next one and trying to get the best possible results. "The manager's still shouting at me, he was doing that this morning. I've put these long hours of rehab in to kick on, to be a better player. Hopefully he'll give me a chance to show what I can do. "It's part of your rehab journey, I want to get back playing for Scotland. First, I wanted to get back playing for Hull City, scoring goals, creating goals. "I've started doing all that, and they're surprised at how well I've done. It was only natural that this was the next step, to be doing what I'm doing at club level and continuing that into international level." Snodgrass insists that the injury has not changed has game, but he believes the time out has tempered aspects of his personality. "I've got a lot calmer. I always used to be on the edge, fiery, you want to win," he said. "I don't know if that's just being Scottish, you're always that aggressive. With Norwich, we were fighting relegation, now at Hull we're going for promotion. It's different levels, stages, managers and players. You're always adapting. "I want to try to excite, to create chances and get assist and goals. That never changes. The most important thing for me is never losing that desire for winning. "I want to be part of it. I've missed too much football and I want to be back involved, helping the club to try to get promotion."